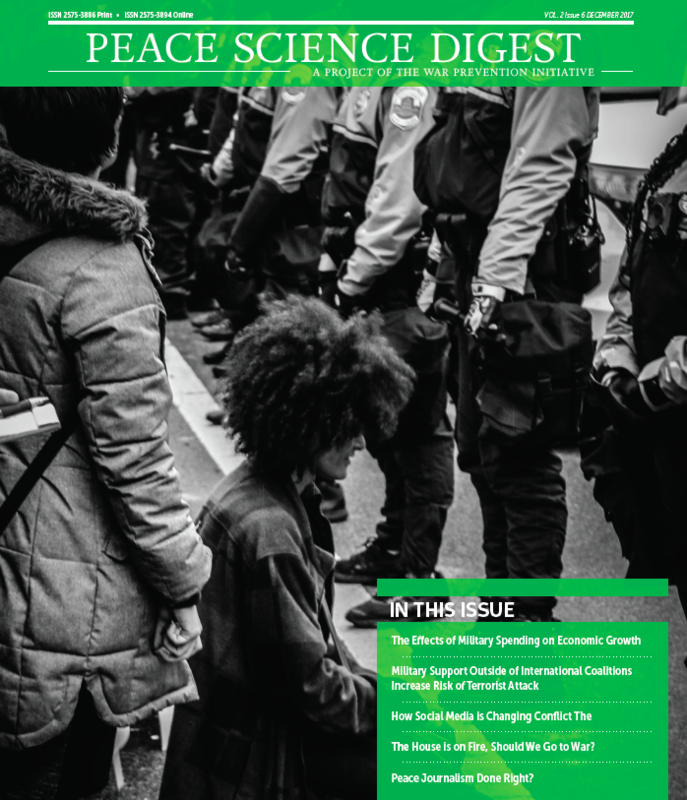 In this issue of the Peace Science Digest, you will find research highlighting the negative effects of military spending on a country’s long-term economic growth—contrary to many beliefs, war is not good for the economy. Next, we look at how ad-hoc military intervention increases the likelihood of retaliatory terror attacks, showing how current military strategies are actually making us less secure. We then turn to the role of social media in violent conflict, and how this new age of communication is changing how conflicts are conducted and how conflict actors communicate. In the fourth analysis, we look at how political leaders consider initiating conflicts abroad to distract from domestic problems. Finally, we look at a contribution aimed at making Peace Journalism more relevant. Click on the icon below to download Volume 2, Issue 6. The House Is On Fire, Should We Go To War? Previous article Peace Journalism Done Right?